Swedish Stereo: Webjokers are getting harder! Few months left since two luckies we followed last Autumn have reached the final of webjoker-contest for Melodifestivalen-2011 and have taken victory that we were really glad tipping them as one of our favorites but will Julia Alvgard with her ballad "Better Or Worse" and Jonas Matsson with guitar pop track "On My Own" be more successful than MiSt (webjokers of MF-2010)? Will they reach final of Melodifestivalen and get a long career in Sweden? We'll know very soon! But now artists in a hottest stage of preparing to contest and both promise that their songs are upgraded and they are on the way to fight. Both Julia and Jonas have got support of the biggest record-labels, Julia - Universal and Jonas - EMI. You can already check Jonas' site to find his with new style and a lot of another interesting stuff. Julia has only Facebook page for now but you can already find her new song there! For now it's just a demo of song "I Was" - track that you're gonna like if you like "Better Or Worse", it sounds more like Rihanna-style r'n'b-ballad, less for schlager-competition but really enjoyable with amazing Julia's voice and in more ready studio-quality. 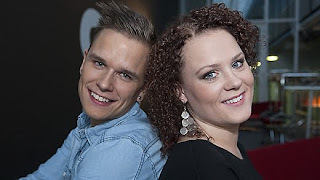 Check it below along with Jonas singing cover "Wonderchild" of his schlager-rival Christian Walz.